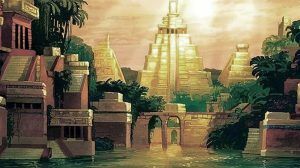 As early as 1530 the Spanish authorities in Mexico heard reports of the “Seven Cities of Cibola,” which were reputed to be exceedingly opulent, but it was not until ten years later that any systematic attempt was made to find them and exploit their wealth. 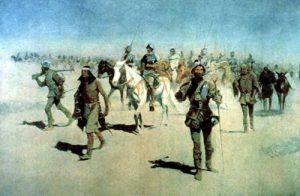 The Coronado Expedition was sent out from New Spain for that purpose in 1540, and while in winter quarters near the present city of Albuquerque, New Mexico, Coronado learned from an Indian slave of a province teeming with wealth somewhere in the interior. This province subsequently became known as Quivira. There is some question as to whether the name “Quivira” is of Indian origin. 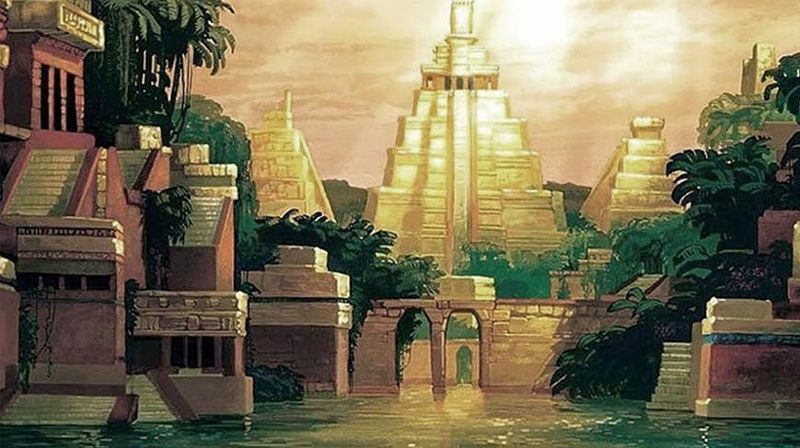 One historian suggests that the original name might have been “Quebira,” from the Arabic word “quebir” — meaning great — and that it was probably first used by the survivors of the Narvaez expedition who found their way to Mexico in the spring of 1536. The province of Quivira was early on claimed by nearly every state in the Missouri Valley, and it was only in the late 19th Century that it was given a definite location by archaeologists. “The province of Quivira is 950 leagues from Mexico. Where I reached it is in the 40th degree. The country itself is the best I have ever seen for producing all the products of Spain, for besides the land itself being very fat and black and being well watered by the rivulets and springs and rivers, I found prunes like those of Spain, and nuts, and very good sweet grapes and mulberries. I had been told that the houses were made of stone and were several storied; they are only of straw, and the inhabitants are as savage as any that I have seen. 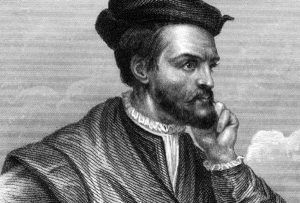 Juan Jaramillo who was on the expedition also gave an account which confirms the description given by Coronado, saying that the only metal found in Quivira consisted of some iron pyrites and a few pieces of copper. As the main objective of the visit was to find gold and silver, the disappointment of the Spaniards can be readily imagined. 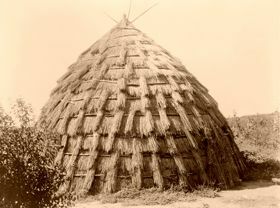 From the fact that the people lived in straw houses, or at least in huts with roofs of straw, historian Frederick Hodge identified the inhabitants of Quivira as the Wichita Indians, which tribe, of all the Plains Indians, were accustomed to thatch their huts with straw. Although many of the Spaniards in Mexico held to the view that vast wealth was to be found in Quivira, no attempt was made to visit the province for more than half a century after the expedition or Coronado. Then came the expedition of Francisco Leyva de Bonilla in 1595 and Juan de Oñate in 1601, but both of these were undertaken without adequate preparations and conducted in such a lax and desultory manner that nothing was accomplished. In the late 19th century efforts were made to ascertain the location of the lost Quivira. The translation of Castaneda’s narrative of the Coronado Expedition by George Winship; the work of the Hemenway archaeological expedition; the investigations and researches of James H. Simpson, Frederick Hodge and others, who have studied and carefully compared the directions and distances given in the relations concerning the movements of Coronado, all point to the region between the Arkansas and Kansas Rivers as the site of the ancient Indian province. 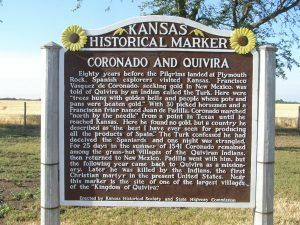 Jacob V. Brower, an archaeologist of St. Paul, Minnesota, made three trips to Kansas for the purpose of determining if possible the location of the original Quivira. The first of these trips was made in November 1896, the second in March 1897, and the third in March 1898. Brower explored the valleys of the Kansas and Smoky Hill Rivers from the mouth of Mill Creek in Wabaunsee County to Lyon Creek in Dickinson County, and also the valleys of the Arkansas River in the vicinity of Great Bend. Through the testimony of stone implements — a method that has been criticized as untrustworthy — he determined the location of six ancient villages. Of these 11 were in Pottawatomie County, 10 in Wabaunsee, 11 in Riley, 20 in Geary, four in Dickinson, six in McPherson, and one each in Marion, Rice and Barton Counties. On October 29, 1901, the Quivira Historical Society was organized at Alma, Kansas, the county seat of Wabaunsee County. One of the principal objectives of the society was to erect monuments marking certain historical sites, and on August 12, 1902, the first of these monuments was unveiled at Logan Grove, near Junction City. More monuments were also erected in Dickinson, Riley and Wabaunsee Counties. 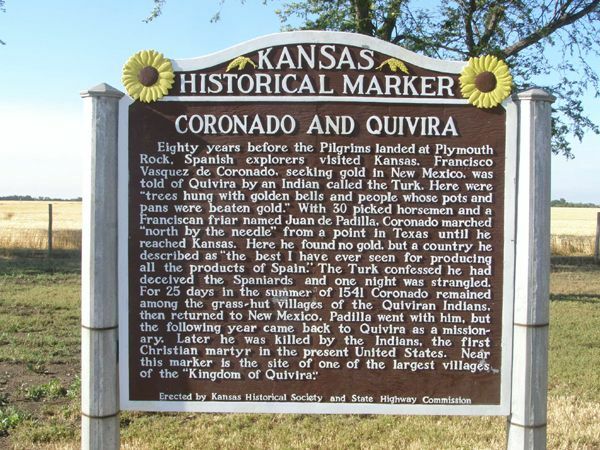 Kansas marker giving a brief history of Coronado’s travels to the area in 1541 located along US Hwy 56 west of Lyons, Kansas. A museum is also dedicated to the site in Lyons, Kansas. The Coronado-Quivira Museum displays artifacts and information on early inhabitants, Spanish explorers, the Sante Fe Trail, and the coming of homesteaders and permanent settlers. It is located at 105 West Lyon in Lyons, Kansas. Compiled by Kathy Weiser/Legends of Kansas, updated July 2018.